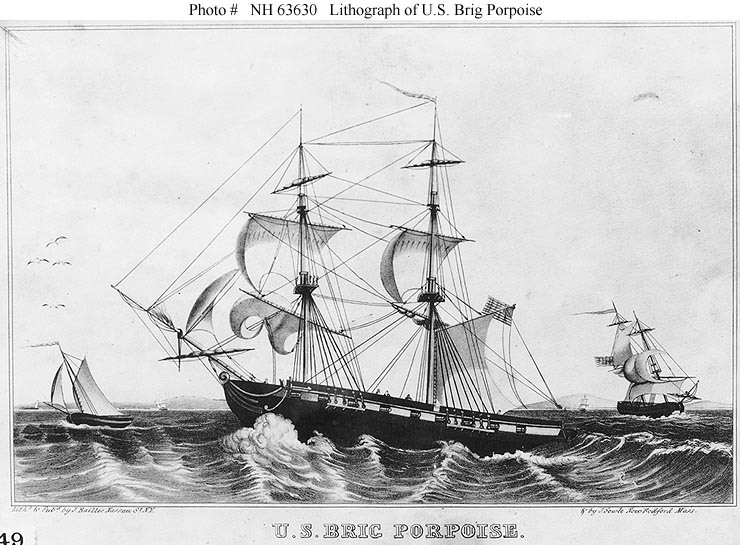 Type and Characteristics - Sailing brigantine or hermaphrodite brig, later brig, Dolphin-class, authorized by Congress 30 June 1834, laid down in 1835, launched 31 May 1836, 224 long tons, 88ft long x 25ft beam x 11ft draft, armed with 2-9pdr cannon and 8-24pdr carronade, 80 crew, first commanded by Lieutenant William Ramsay. Log Period and Areas of Service - 1854, Surveying Expedition to the North Pacific Ocean. May 1853 - Recommissioned and assigned to Surveying Expedition. Joined Squadron at Hampton Roads. 11 June 1853 - Departed with Squadron. Sailed via Cape of Good Hope and charted many Pacific islands. March 1854 - Arrived in China. Fate: Sailing from China to explore the Bonin, Ladrone and Marianas island groups, parted company with rest of the squadron between China and Formosa on 21 September 1854, never heard of again - believed foundered some days later in typhoon.